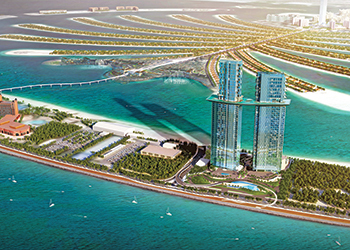 Palm 360, a twin-tower hotel and residential project on The Palm Jumeirah, is scheduled for delivery in 2020. Hotel developers continue to bet on the region as a must-go destination for business and leisure. Fifty-three million people packed their bags and came to the Middle East last year, and while this number is nowhere near the 603 million that flocked to Europe, it is interesting to note that the Middle East now has more rooms in the pipeline than Europe, as developers continue to pump money into the region. A September Pipeline Report from global analytics expert STR revealed that a total of 159,127 rooms in 555 projects are under contract in the Middle East, compared to 152,705 rooms in 1,016 projects across Europe. ‘Under contract’ covers projects in the construction, final planning and planning stages. The Middle East figure also represented a 14.8 per cent increase in rooms, compared with September 2015. More importantly, some 257 hotels housing more than half the rooms under contract – 83,416 rooms – are currently in the construction phase, according to the report. This represents an 8.5 per cent increase in year-over-year comparisons. The growth comes with good reason. There are world-class events such as the World Expo 2020 in Dubai and the Fifa World Cup 2022 in Qatar on the horizon, both of which are expected to draw millions of visitors from across the world, while governments in the Gulf are also stepping up efforts to woo tourists on a budget, in addition to the big spenders. Dubai, for instance, is encouraging the construction of new hotels, especially mid-market ones, through a municipality tax waiver given if a construction permit is granted by December next year, according to reports. The emirate also recently marked a milestone when its tally of rooms reached 100,000, following the opening of the Westin Dubai Al Habtoor City in August. Looking at countries in which these new hotels are rising up, Saudi Arabia leads the way with 36,545 rooms in 78 hotels. The UAE follows with 26,552 rooms in 94 hotels. Two other countries each have more than 5,000 rooms in construction: Qatar with 7,889 rooms in 33 hotels, and Egypt with 5,800 rooms in 17 hotels. Meanwhile, a report by Tophotelprojects indicates that some 316 new-build hotels will open next year, providing a whopping 84,337 new rooms on the market for tourists and holidaymakers. The report, titled The Middle East and Africa Hotel Construction Overview, was prepared for The Hotel Show held in Dubai in September. It states that the UAE accounts for almost 20 per cent of those developments, with 56 projects set to open in 2017. Saudi Arabia is close behind with 51 builds in the pipeline, while Turkey (28), Qatar (18), and Morocco (17) are also set for a busy 12 months. Superlatives ranging from ‘the tallest’ to ‘the most expensive’ have become almost commonplace among the Middle East’s hotels and next year see will the addition of another one when the Abraj Kudai Towers in Makkah opens, becoming the world’s biggest hotel with no less than 10,000 rooms. Qatar too will be aiming for its share of superlatives, with plans to build a hotel shaped like a desert flower close to the site of the 2022 Fifa World Cup final in Lusail. The 38-storey tower was designed by the late Iraqi-British architect Zaha Hadid. It is shaped in the form of a hyacinth and features a nine-pointed base to shield visitors from the searing Gulf sun. According to Tophotelprojects figures, there are 183 hotel projects and 54,000 hotel rooms in the UAE pipeline, with the majority of the new hotels expected to open before 2020. Of these, 56 hotels are expected to come into operation next year, with 58 more in 2018. Dubai and Abu Dhabi have the most projects under way, with 131 hotels accounting for 41,133 rooms in Dubai, and 24 in Abu Dhabi with 6,486 rooms. Sharjah has six projects, with 959 rooms, and Ras Al Khaimah has five with 1,847 rooms. Among the new hotels is Hard Rock Hotel Dubai Marina, which is set to open shortly with 288 rooms, the Hard Rock Hotel Abu Dhabi, expected to open in 2017, and the ME Dubai Hotel designed by the late architect Zaha Hadid, also due for launch in 2017. Another major attraction will be Paramount Hotel Dubai, part of the four-tower Paramount Tower Hotel and Residences project, which will have 823 rooms when it opens in the third quarter of next year, according to the developer Damac. The Landmark Group’s Citymax Hotel will open in Al Barsha with 120 rooms, while another 375-room property will be launched in Business Bay in Dubai in 2017. A 204-room Citymax in Ras Al Khaimah is expected to open next year. Also, Emaar Hospitality Group is to build it first beachfront resort property under its flagship Address hotel brand in Dubai. The property includes The Address Jumeirah Resort + Spa, The Address Residences Jumeirah Resort + Spa and The Residences Jumeirah Dubai. The Address Hotels + Resorts will manage the 182-room hotel, serviced residences and residential apartments in the spectacularly designed towers. Meanwhile, looking at regional cities with the largest number of hotel openings, Dubai leads the rankings with 133 hotels projects under way, followed by Riyadh with 47 and Doha with 41, according to Tophotelprojects. Doha’s busiest year for hotel openings is forecast to be 2017 with 14 new properties entering the market, including Pullman Doha West Bay (468 rooms), JW Marriott West Bay (297 rooms), Hilton Garden Inn Doha Al Sadd (225 rooms), and Millennium Plaza Doha (232 rooms). The five-star Millennium Plaza Doha will open as part of the new Barwa Al Sadd development. Comprising four high-rises offering commercial, residential and office space, the major project, currently under construction, will also offer a range of restaurants, shops and recreational facilities. While Kuwait has a relatively low profile in the hotel openings listing, the state too is expected to see a surge in investment in the sector until 2020. Hilton is introducing two new brands at The Avenues Mall in Kuwait City with the Conrad Kuwait, which will add another 158 rooms and Hilton Garden Inn Kuwait, a further 430. Four Seasons is launching a further two properties across the country while Grand Hyatt has a property slated for opening in 2020. In Oman, the Oman Tourism Development Company (Omran) is on track to deliver three new hotels in Muscat, providing more than 900 additional rooms in 2017/18. The hotels include the five-star W hotel currently under construction alongside the expansion of the Royal Opera House in the heart of the capital, as well as the five-star JW Marriott and four-star Crowne Plaza located next to the Oman Convention and Exhibition Centre (OCEC) and within the flagship Madinat Al Irfan master-development. These hotels will support the sultanate’s expansion of its leisure tourism and Mice (meetings, incentives, conventions and exhibitions) industries. Marriott International, meanwhile, is planning to open four hotels in Oman in the next five years. Marriott currently operates three properties in the sultanate: the newly opened Sheraton Oman Hotel, the Al Bustan Palace and the Salalah Marriott Resort in Salalah. During the next five years, it plans to double its portfolio in the country with four properties and 1,095 rooms in the pipeline. These will be the Aloft Muscat with 175 rooms, the W Hotel Muscat with 250 rooms, Westin Muscat with 350 rooms and the JW Marriott Muscat Convention Centre with 320 rooms. The regional hotel boom – with more than 250 hotels under construction – comes at a time when tourism is back on an uptrend. International arrivals in the Middle East are estimated to have grown by one million in 2015 to 53 million, consolidating a rebound that started in 2014, when arrivals increased by seven per cent, following three years of decline, according to a United Nations World Tourism Organisation (UNWTO) report released in August. And with the UNWTO also predicting that international arrivals to the Middle East is expected to rise to 61 million by 2020 and on to 149 million by 2030, it would appear there remains ample room for growth in the tourism and Mice industry in the region.